The Rev. James Forbes who arrived from Scotland to minister in the colony held his first service on 3 February, 1838. Rev. Forbes' first church was a temporary wooden building at the west end of Collins Street whilst the congregation applied for an official grant of land. Two acres on the present site were obtained in 1839 and a school was subsequently built. This school also served as a church on Sundays until a proper church building, seating five hundred was built in January 1841. The present Scots church erected to the designs by Reed and Barnes replaced this building on the site. The foundation stone was laid on 1 April, 1873, and the building opened 29 November 1874. David Mitchell, who was the father of the famous Australian soprano-Dame Nellie Melba, at one stage, a chorister in the Choir, built the church. Scots Church is built in the Gothic Revival style. Bluestone was used for the foundations, Barrabool Hills Freestone from Geelong for the superstructure and cream-coloured Kakanui Stone from New Zealand for the dressings. Features of the interior include the basalt aisle columns, rich timber fittings, stained glass windows and carved organ casework. In the last century, the apse was dominated by a stone pulpit and reredos erected as a memorial to Rev. Irving Hetherington (Minister: 1847-1875) and his assistant Rev. Peter Menzies (Minister: 1868-1874). It was Rev. Menzies in particular who played a major part in the design of this church and in the encouragement of the music in the services. In 1928 the pulpit and the lower part of the apse were altered and the current design adopted. Since then, in progressive stages, the original Tasmanian Blackwood panelling has been extended to surround the entire nave, and in the late 1930s the current vestries were added. Following a severe storm in 1963, the top of the spire had been extensively damaged by lightening and lowered by 40 feet. 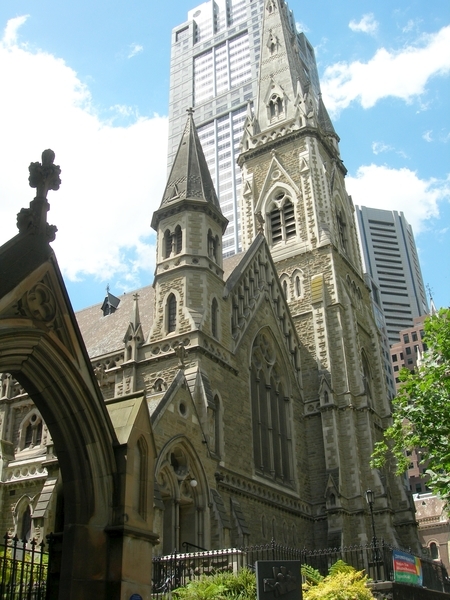 However, in 1989 the exterior stonework was restored, and the spire rebuilt to its original height, regaining its traditionally important position in the Melbourne skyline. 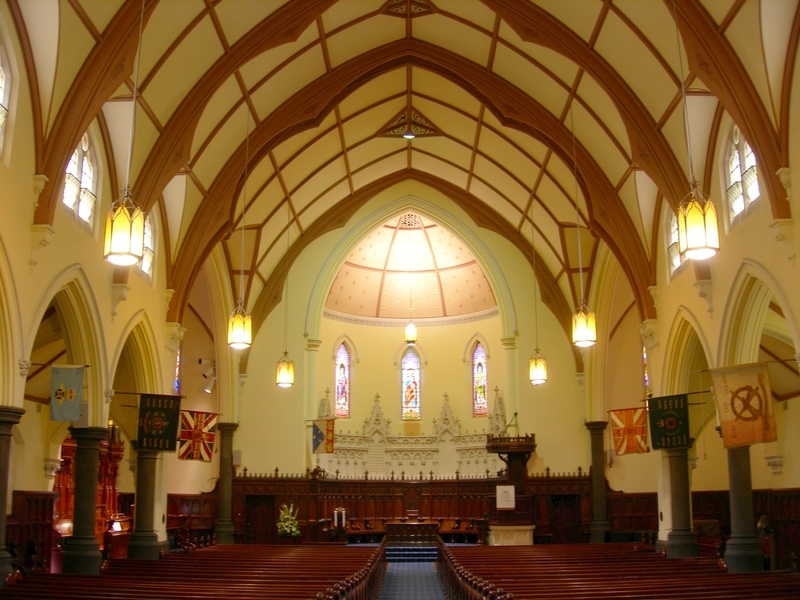 Scots Church is of social, historical, aesthetic and architectural significance to the State of Victoria. Scots Church is of social and historical significance as a focal point for the Presbyterian Church in Victoria and as the site of the original Scots church constructed in 1841. The church is associated with notable churchmen, particularly the Rev. James Forbes who held his first service on 3 February 1838. Scots church is important for its association with David Mitchell who constructed the church, was a prominent Melbourne builder, and whose daughter (later Dame Nellie Melba) sang in the choir. Scots Church is of aesthetic and architectural significance for its prominent siting and importance in the Melbourne townscape. The church is a fine example of Gothic Revival architecture of the decorated mode, which is unusual amongst Presbyterian Church buildings. The Church is an important design of the prolific Melbourne architects Reed and Barnes who operated as a partnership between 1862 and 1883. Scots Church is important for its elaborate and diverse range of stained glass windows throughout the church. Of particular note are those by Ferguson & Urie; Vanderpoorten of Brussels and F.X. Zettler of Munic. The carved cedar casework around the organ is important as part of the original church design of Reed and Barnes. It survives as the original portion of Melbourne's largest church organ at the time of its construction in 1874. 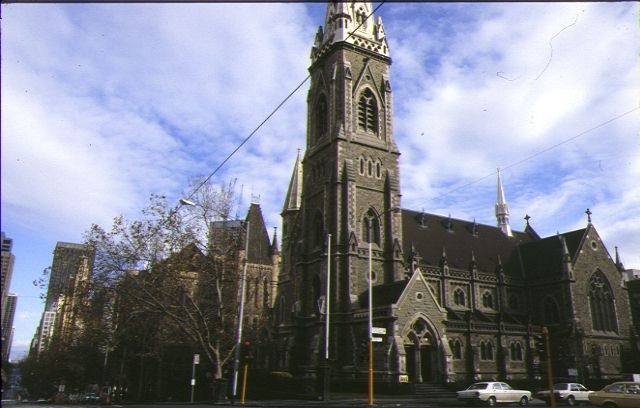 Scots Church, corner of Collins and Russell Streets, Melbourne, Melbourne City Council. 1. 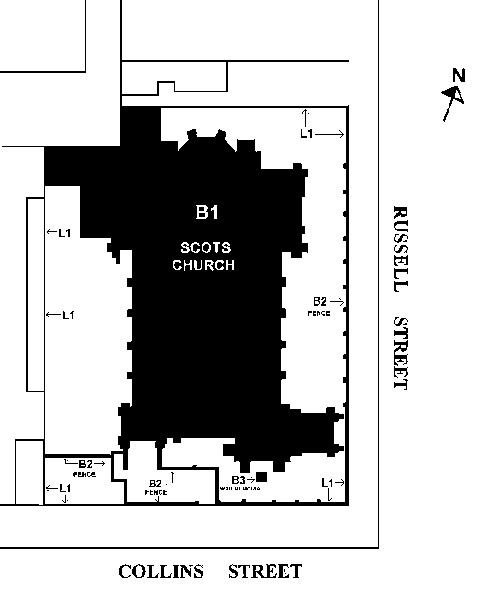 All the buildings marked B1 Scots Church, B2 Fence including bluestone base, lamps and pillars and B3 War memorial to the Victorian Scottish Regiment on Diagram 601868 held by the Executive Director. 2. All the land marked L1 on Diagram 601868 held by the Executive Director being all the land described as Certificates of Title Volume 5294 Folio 656 Crown Allotment Eight and part of Crown Allotment 9, Section 11, City of Melbourne, Parish of North Melbourne, County of Bourke. The World War 1 and World War 2 honour board. In May 1835, John Batman sailed across from Tasmania in order to explore the Yarra River. His exploration rapidly led to the settlement of the area, which was to grow into the Melbourne of today and was soon followed by the first move to establish a church in Melbourne. It was Dr. Alexander Thomson who held Presbyterian services on the banks of the Yarra in 1836, but he was soon followed by Rev. James Clow, a retired East India Company Chaplain, who conducted his first service on 31 December 1837 . So it was that the Presbyterian Church was the first church in Melbourne; the first Christian denomination to have regular services of worship conducted by an ordained minister . The Rev. James Forbes arrived from Scotland to minister in the colony, his first service was held on 3 February, 1838. Rev. Forbes’ first church was a temporary wooden building at the West end of Collins Street whilst the congregation applied for an official grant of land. Two acres on the present site were obtained and a school was subsequently built. This school also served as a church on Sundays until a proper church building, seating five hundred . However, the population and congregation were still growing, and the congregation resolved in January 1869 to build a new church designed by the notable architects Reed & Barnes. This is the Scots’ Church that you see today . Situated on land granted to the Presbyterians in 1839. The present Gothic revival church was built in 1873-74 by David Mitchell to designs by architects Reed and Barnes . The style of the church is decorated Gothic, which is somewhat unusual amongst Presbyterian Church buildings. Bluestone was used for the foundations, Barrabool Hills Freestone from Geelong for the superstructure and cream-coloured Kakanui Stone from New Zealand for the ‘dressings’. The church which is 120 feet long and 68 feet wide, seats 1,000 people in the nave. The height of the spire was originally 211 feet-the spire was for many years the highest point in the city. The church was built by David Mitchell, who was the father of the famous Australian soprano-Dame Nellie Melba, at one stage a chorister in the Choir. The foundation stone was laid on 1 April, 1873, and the building opened 29 November 1874 . Whilst the exterior of the church has changed little in the succeeding century, the interior particularly the Apse- has been altered considerably . In the last century, the apse was dominated by a stone pulpit and reredos erected as a memorial to Rev. Irving Hetherington (Minister: 1847-1875) and his assistant Rev. Peter Menzies (Minister: 1868-1874). It was Rev. Menzies in particular who played a major part in the design of this church and in the encouragement of the music in the Services. In 1928 the pulpit and the lower part of the Apse were altered and the current design adopted. Since then, in progressive stages, the original Tasmanian Blackwood panelling has been extended to surround the entire nave, and in the late 1930s the current vestries were added in a style appropriate to the rest of the building . The church is a fine example of Gothic Revival architecture of the decorated mode, which is unusual amongst Presbyterian Church buildings. The church is a fine example of Gothic Revival architecture of the decorated mode. The church is a fine example of Gothic Revival architecture of the decorated mode, which is unusual amongst Presbyterian Church buildings. Scots Church is an important design of the prolific Melbourne architecture partnership of Reed and Barnes which, operated between 1862 and 1883. Scots Church is important for its elaborate and diverse range of stained glass windows throughout the church. Of particular note are those by Ferguson & Urie; Vanderpoorten of Brussels and F.X. Zettler of Munic. The carved cedar casework around the organ is important as part of the original church design of Reed and Barnes. It survives as the original portion of Melbourne's largest church organ at the time of its construction in 1874. The church is associated with notable churchmen, particularly the Rev. James Forbes who arrived from Scotland to minister in the colony, his first service was held on 3 February 1838. Scots church is important for its association with David Mitchell who constructed the church, was a prominent Melbourne builder, and whose daughter (later Dame Nellie Melba) sang in the choir. 1. All alterations are to be planned and carried out in a manner, which prevents damage to the fabric of the registered place or object. * Minor Repairs and maintenance which replaces like with like. Repaint the roofs of the dormer vents in slate grey and paint the louvres in a brown ?timber? colour (currently slate grey) Rebuild the timber sections of the small spire and finish them in brown ?timber? paint. Paint the pressed metal shingles and flashings of the small spire in slate grey (currently beige).